Kunbo Xu initially started playing the violin at age five. 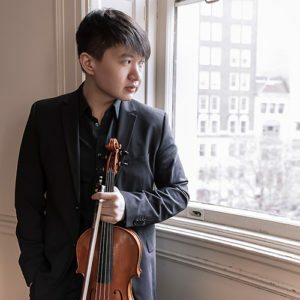 In 2007, he was accepted into the Middle School affiliated with the Xinghai Conservatory of Music and, in 2009, switched to the viola and continued his studies with Dong Lei Hou. Since then, Mr. Xu has won prizes at numerous competitions including first prize at the 2013 Xinghai National Cup for Young Violists held in Guangzhou, third prize in the junior division of the 2011 “Viva la Viola” National Competition held at the Shanghai Conservatory, and second prize at the 2010 Hong Kong Young Musician of the Year Competition. In prior years, Mr. Xu has been selected to participate in the Morningside Music Bridge International Music Festival to study with Teng Li and won its Concerto Competition in 2011, resulting in a solo performance of the Walton Viola Concerto with the Calgary Philharmonic Orchestra. He has also been invited to the Casalmaggiore International Music Festival on a full scholarship to study with Roger Chase. Mr. Xu currently studies with Hsin Yun Huang at the Curtis Institute of Music.